The Kansas defense sets up a zone late in the first-half in a Jayhawks game against Texas Wednesday, Jan. 31, 2018 at Allen Fieldhouse. The frustration oozing out of Brandon Schneider was palpable. 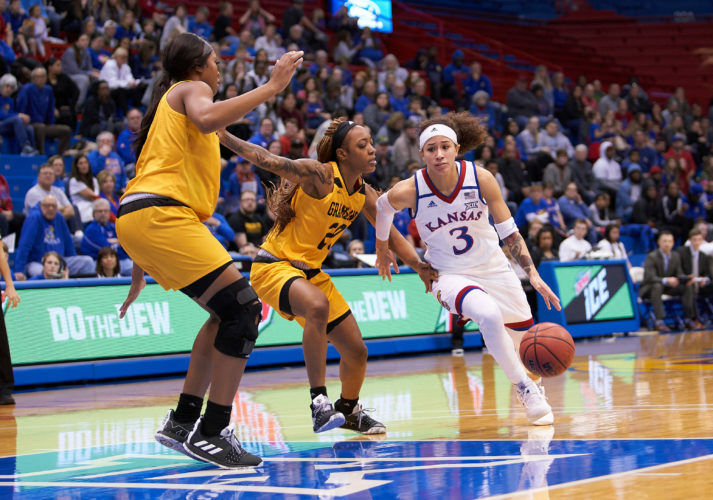 The Kansas women’s basketball team fought hard with No. 8 Texas into the fourth quarter. After improbably erasing a 14-point deficit to tie things up in the third, the Jayhawks trailed by only five in the final period at Allen Fieldhouse. Yet, on a day when the bench sparked a rally with some of its grittiest minutes of the season, KU lacked contributions from two of its most important players. The result, a 55-41 loss on Wednesday, left the KU coach, appropriately donning all-back attire, less than pleased. Looking at the box score, it wasn’t hard to spot the weak links in the chain. Kylee Kopatich, second on the team in scoring this season, was held to just 1-for-5 shooting and finished with more fouls (4) than points (2). Austin Richardson, who tallied nine points and six rebounds in the Jayhawks’ loss in Austin, was held to two points, while committing three fouls and seven turnovers. As a team, the Jayhawks committed 20 turnovers, seven of which came in the fourth quarter. The Longhorns committed only 12 on the evening and had none over the final 11 1/2 minutes. Really, the Jayhawks needed to be more than average to defeat their highly favored opposition. The Jayhawks needed to do a better job on the glass than they did in Austin, allowing 26 offensive boards. KU allowed only 10 and hung tough in the rebounding battle. KU also needed a better defensive performance than in that previous meeting. With Christalah Lyons (18 points, 9 rebounds), Brianna Osorio, Chayla Cheadle, sparingly-used Sydney Benoit and Chelsea Lott in the game, they found exactly that. For nearly eight consecutive minutes, starting in the second quarter and extending well into the third, the Jayhawks held the Longhorns without a bucket. That counted the first 5 1/2 minutes of the third quarter, of which Benoit played all but 33 seconds, when the Jayhawks held the Longhorns (17-4, 8-2 Big 12) scoreless and tied the game up at 30-30. True to form, it was a hard-nosed offensive rebound by Benoit that led to the basket that cut the deficit to 3. Then, Benoit picked up another board, which led to a 3-pointer by Osorio (8 points) to tie the game. Asked if she was especially sore from all the floor burns she racked up, Benoit responded with a smile. The performance perhaps left more of a mark on Schneider, who mentioned the former walk-on by name in his opening remarks. But without the firepower of its mainstays, to which Schneider alluded, KU didn’t have enough answers down the stretch. KU, now 11-11 (2-9 Big 12) on the season, held the Longhorns to 36.2 percent shooting from the field and 25.0 percent from 3-point range. But costly turnovers, untimely mishaps and a lack of production at the other end — KU shot just 31.3 percent from the field and 33.3 percent from the free-throw line — left too big a hole to climb out of.